New permanent teeth are 50% more vulnerable to damage than adult teeth and can take up to 3 years to reach full strength. 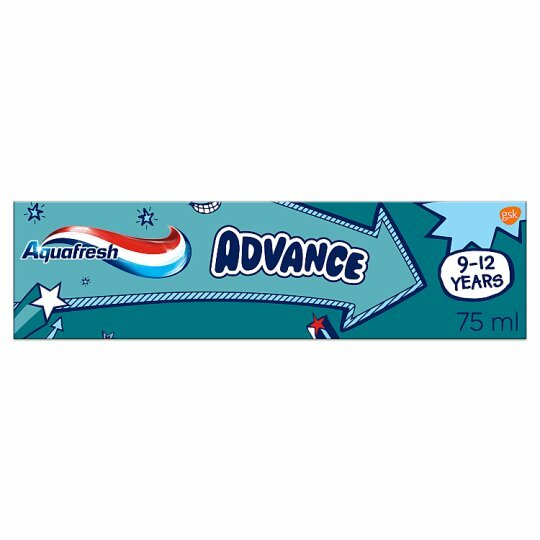 Aquafresh Advance toothpaste is specially designed by dental experts for children 9-12 years to provide expert protection for new permanent teeth whilst being gentle on vulnerable enamel. 24h Sugar Acid Protection provided by Fluoride. Limit sugary snacks between meals and also brush twice daily with a fluoride toothpaste. Best used before the end of: see end of carton. Keep out of reach of children. Children of 6 years and younger: use a pea sized amount for supervised brushing to minimize swallowing. In case of intake of fluoride from other sources, consult a dentist or doctor. If irritation occurs, discontinue use. The ends of this carton have been glued down. Do not use if carton ends are open.